When I was a teenager, one of my older brothers was living with us, and he had a Siamese cat. This cat, like many Siamese, was cross-eyed, and we realized he was seeing two of everything. When he would walk into the living room and glance over at the sliding glass door, he would see two Siamese cats that looked just like him staring back. These cats would mirror his every move and growl. He would eventually attack, only to be turned back by the window. It was great entertainment! The cat got a superiority complex, which I am sure was because he stared down two cats on a daily basis and was never harmed. Do we live a life that is focused and Jesus and His sacrifice for us? When we remember our sins, are we taking them (and leaving them) at the foot of the cross? If we are not “cross-eyed” then we will be haunted by the guilt of the past and never know peace in our lives. It is also impossible to rein in our foolish pride if we are not “cross-eyed”. The cross shows us what our sinful actions and attitudes deserve. Knowing that every one of us is guilty before God of capital crimes, no matter how righteous we appear relative to others, leaves no room for boasting. All we have left to boast of is the magnitude of Christ’s love for us. Perhaps being “cross-eyed” doesn’t make any sense to you. After all, the cross was a cruel instrument of torture, and was used to inflict a horrific death upon any who were placed upon it. You were considered accursed if you were crucified. Even in the times before it was invented, those who were hung on a tree were considered cursed by God. It just doesn’t make sense to those who are outside of Christ why we would worship someone who was cursed! At first glance such a proposition looks foolish indeed. The Apostle Paul said that many would feel this way, even in the First Century. 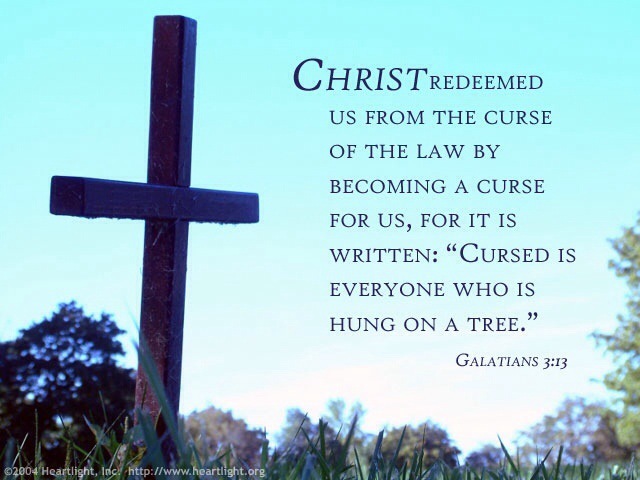 But in order to take our curse upon Himself and atone for our sins, Jesus had to die the death of a cursed man, so we could be made the righteousness of God in Him. What did this accomplish? Glad you asked! who Himself bore our sins in His own body on the tree, that we, having died to sins, might live for righteousness—by whose stripes you were healed. 25 For you were like sheep going astray, but have now returned to the Shepherd and Overseer of your souls. So let us fix our eyes on Jesus and follow after Him. We must be “cross-eyed”, just like He was. As we follow Him to the cross on a daily basis, we are reconciled, renewed, and refocused. For on our daily cross, we must crucify our old nature with its sinful desires, and walk as He walked. I don’t know if you have noticed or not, but people tend to walk in the direction they are looking. So let us be “cross-eyed” and crucified as we journey to heaven. And I think that is one of the reasons for observing The Lord’s Supper and doing so often. It helps to keep us cross-eyed. It is so effective at doing so that it baffles me that some churches do not participate in this every week. We are human and constantly need reminders to keep ourselves focused on what is important. Communing with other believers around the Table of The Lord is designed by God for that very purpose. And in doing so we are reminded that we, too, need to daily take up our cross as we are crucified with Him.